Definition at line 861 of file LLVMContextImpl.h. Definition at line 867 of file LLVMContextImpl.h. Definition at line 869 of file LLVMContextImpl.h. Definition at line 878 of file LLVMContextImpl.h. Definition at line 873 of file LLVMContextImpl.h. 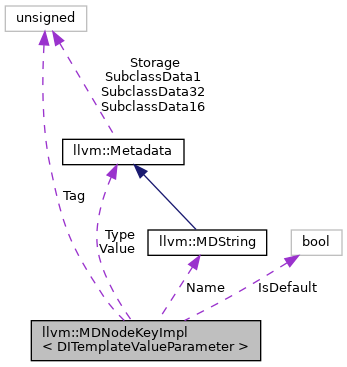 References llvm::DITemplateParameter::getRawName(), llvm::DITemplateParameter::getRawType(), llvm::DINode::getTag(), and llvm::DITemplateValueParameter::getValue(). Definition at line 863 of file LLVMContextImpl.h. Definition at line 862 of file LLVMContextImpl.h. Definition at line 864 of file LLVMContextImpl.h. Definition at line 865 of file LLVMContextImpl.h.